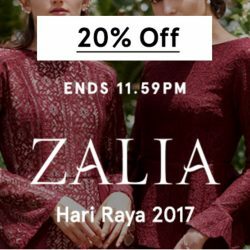 23 May 2017, 11.59pm Zalora: Enjoy 20% OFF Zalia to celebrate Hari Raya 2017! Our Muslim readers, dun miss this offer! Enjoy 20% Off ZALIA to celebrate Hari Raya at Zalora today till 11.59pm! Get your Hari Raya outfits now!